In the late morning, everyone except my Mom (who wasn't feeling well) piled in the Dodge minivan and drove to Poipu, which is on the south side of Kauai. 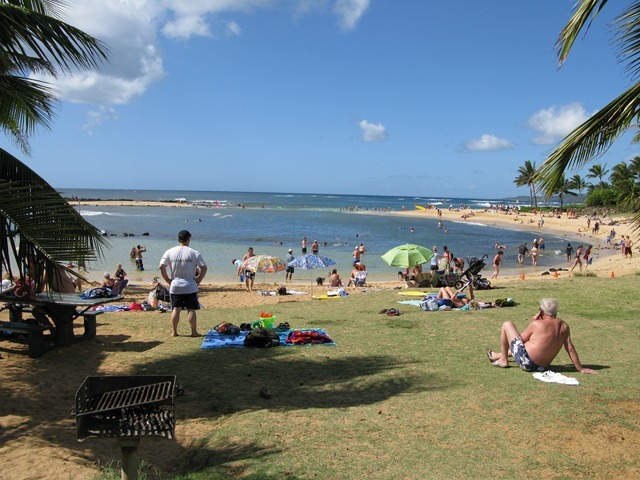 Poipu has one of the best beaches for snorkeling, especially for kids, because the water is shallow and the fish are plentiful. A few years before, I'd had a transcendent experience snorkeling on this beach where I'd finally gotten the hang of floating around with fish and the ocean. Once we arrived at the beach and got our base camp set up, Brenda, Cam, and my Dad went snorkeling while I sat on the beach with Drew. (It turned out that Drew didn't want to go in the water -- no matter what.) So, that meant we'd be taking turns with him. 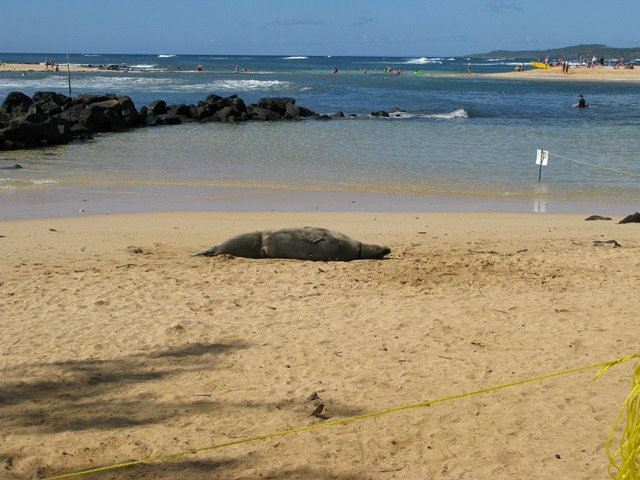 On this particular day, there was a huge monk seal lying on the beach, and the beach patrol had roped off the area so no one would bother him. 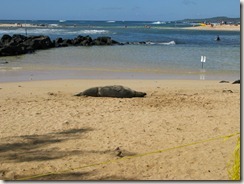 I'd seen seals basking on a dock or rocks before, but never on the beach like this. 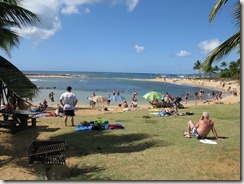 After a while, my Dad came out of the water and offered to watch Drew while I went snorkeling. I grabbed my gear and walked down to the water. As usual, the water felt cold when I sat down in it -- which is due to the air being so warm -- but after a few minutes I was used to it. Like my experience before, I floated over the rocks and saw schools of brightly-colored fish. This time, Cameron was snorkeling right next to me, occasionally giving me the thumbs-up under water when we saw an especially interesting fish. After about 30 minutes, I was ready to stop snorkeling. The salt kept building up in my snorkel leaving an awful taste, and the shallow depth made it somewhat difficult to maneuver effectively. I knew I was ready for more advanced snorkeling. 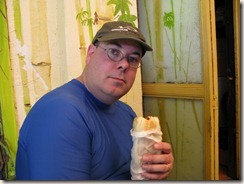 Plus, I knew it was time to go to Puka Dog. 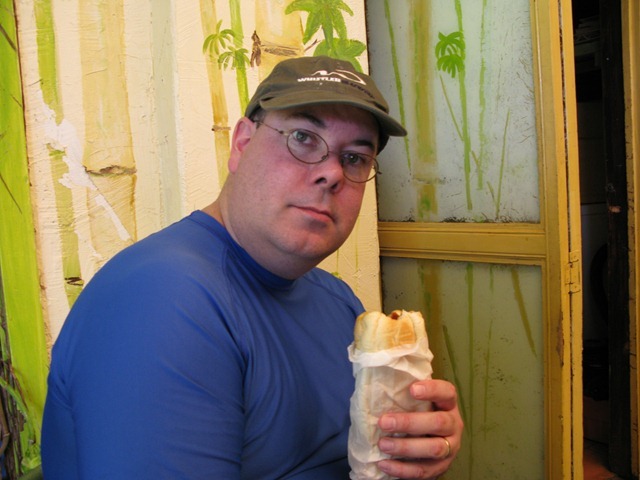 A few years ago I was watching a Travel Chanel show about hot dogs. 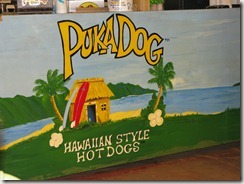 On their list of the best hot dog places in the U.S. was Puka Dog (pronounced "pooka") in Kauai. The difference with these dogs was that they were stuffed into a small loaf of Hawaiian bread. Then they filled them with exotic Hawaiian relishes. At the time I was watching this show, I'd just returned from Kauai and I was disappointed I'd missed this place. 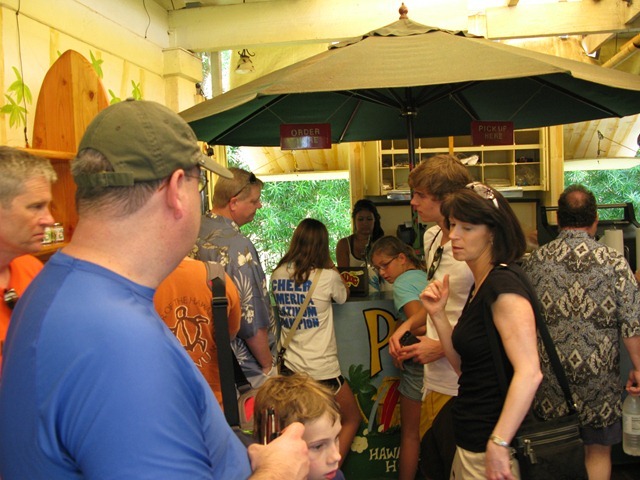 Since we'd arrived on Kauai, I'd worked up the entire family (except Brenda, who doesn't eat hot dogs) for a visit to Puka Dog. 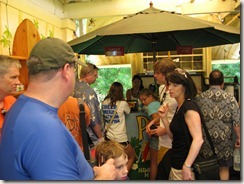 We parked at the shopping center where Puka Dog is located and started standing in line with everyone else. 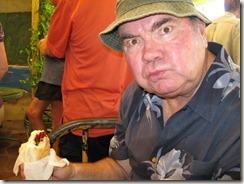 It took a while, but we finally were sitting down and eating our Puka Dogs. Cameron had ordered his with just ketchup and mustard. I'd ordered mine with mango relish, I think. And when I sunk my teeth into that dog, I have to say I was disappointed. It was just too sweet for me. The relish was more like syrup than, say, a real hot dog relish. I like a more savory hot dog, I guess, and thought that the next time I'd order a dog like Cameron's -- with just ketchup and mustard. 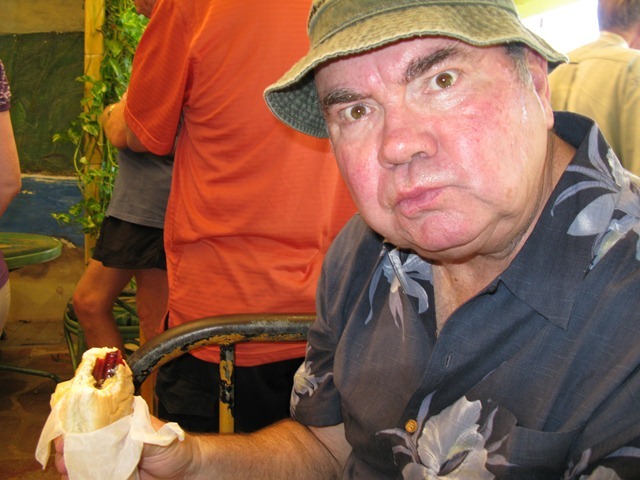 My Dad enjoyed his Puka Dog, but he'd ordered it extra spicy -- and it wasn't spicy enough for him. So, he was a little disappointed too. But how could I not be disappointed? I'd built up my expectations for literally years. There was no way Puka Dog could live up to these type of expectations. I'll return on my next trip and try one of these dogs without all the syrupy relish.